Steel casting is a specialized form of casting involving various types of steels. Steel castings are used when cast irons cannot deliver enough strength or shock resistance. A steel casting is the product formed by pouring liquid steel into a mould cavity. The liquid steel cools and solidifies in the mould cavity and is then removed for cleaning. Heat treatment may be needed to meet desired properties. This process provides the near net shape and mechanical properties required for meeting the specifications. The differences between steel castings and wrought steels are principally in the method of production. In the case of wrought steel cast ingots, slabs, blooms, and billets are mechanically worked to produce flat, sectional or tubular products. However, steel castings are produced in the final product (near net shape product) form without any intermediate mechanical working. The making of a steel casting is a long and complex process. A large investment in capital equipment is required for the melting of steel, manufacturing of cores and moulds and the cleaning and heat treating of castings. Additional major investments for support equipment and facilities are required for sand reclamation systems, dust collection devices and bulk material handling systems etc. Steel castings are used for vitally important components in the mining, railways, automotive, construction, military, and various industries including oil and gas industries. Steel castings are specified for applications which require weldability, abrasion resistance, high strength, low and high temperature service and corrosion resistance. Though there are large numbers of steel foundries, yet due to the diversity of market requirements such as size, tolerances, chemistry, volume, etc., a single foundry cannot serve all of the market and each foundry tends to specialize in a portion of the total market. Some of the specialized areas are (i) railways, construction equipment, and truck and mining industries, and (ii) high alloy stainless steel used in corrosion and heat resistant applications or low volume prototype and service parts. Examples of items which are produced in the form of steel castings include (i) hydroelectric turbine wheels, forging presses, gears, railway wagon frames, valve bodies, pump casings, mining machinery, marine equipments, turbocharger turbines, and engine cylinder blocks etc. Steel castings are categorized into two general groups namely (i) carbon (C) steel castings and (ii) alloy steel castings. Alloy steel castings are generally further broken down into two categories namely (i) low alloy steels castings and (ii) high alloy steel castings. Low alloy steel castings have less than 8 % alloying elements content while high alloy steel castings have 8 % or more alloying element contents. 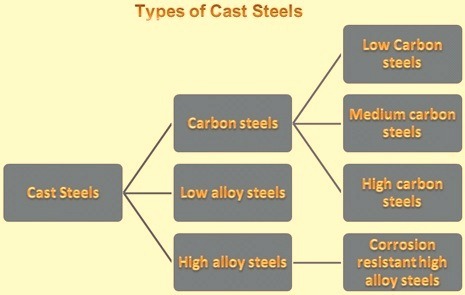 Fig 1 shows the types of cast steels. C steels contain only carbon as the principal alloying element. Other elements are present in small quantities, including those added for deoxidation. Silicon (Si) in cast C steels typically range from 0.25 % to around 0.8 % and manganese (Mn) typically ranges from 0.5 % to around 1 %. C steels can be classified according to their C content into three broad groups namely (i) low C steels with less than and equal to 0.2 % C, medium C steels with 0.2 % to 0.5 % C, and (iii) high C steels with more than and equal to 0.5 % C.
The elements present in low C cast steel, other than carbon are Mn (0.5 % to 1 %), Si (0.25 % to 0.8 %), and sulphur (S) and phosphorus (P) up to 0.05 % maximum each. Residual elements such as nickel (Ni), chromium (Cr), copper (Cu), and molybdenum (Mo) may be present in small amounts. Cast C steels containing less than 0.1 % C are mainly produced for electrical and magnetic equipment and are normally given a full anneal heat treatment. Some castings for the railways and the automotive industries are produced from low C cast steel. Steel castings in low C are also produced for case carburizing, by which process the castings are given a hard wear resistant exterior and a tough, ductile core. The magnetic properties of cast low C steels make them useful in the manufacture of electrical equipment. The medium C cast steels represent the bulk of steel casting production. A very large proportion of cast steel in the medium C grades is heat treated by normalizing, which consists of cooling the castings in air from about 55 deg C above the upper critical temperature. A stress relief treatment is used to relieve stresses set up in the casting by cooling conditions or welding operations and to soften the heat affected zone (HAZ) resulting from welding. The steel castings of medium C are used in wide applications which include railways and other transportation industries, machinery and tools, equipment for rolling mills, mining and construction equipment, and many other miscellaneous applications. High C cast steels contain other elements such as Mn (0.5 % to 1 %), Si (0.3 % to 0.8 %), and P and S (0.05 % maximum each). Because of their high C contents, these grades are the most hardenable of the plain C cast steels. They are therefore used in applications which need relatively high strength levels. The compositions of low alloy cast steels are characterized by C contents primarily under 0.45 % and by small amounts of alloying elements, which are added to produce certain definite properties. Low alloy steels contain alloying elements, in addition to C, up to a total alloy content of 8 %. Cast steels containing more than certain amounts of a single alloying element are considered low-alloy cast steels. These amounts for single alloying elements are Mn – 1 %, Si – 0.8 %, Ni -0.50 %, Cu – 0.5 %, Cr- 0.25 %, Mo – 0.1 %, vanadium (V) – 0.05 %, and tungsten (W) – 0.05 %. Low alloy steels are used when strength requirements are higher than those obtainable with C steels. Low alloy steels also have better toughness and hardenability than C steels. C – Mn cast steels contain 1 % to 1.75 % Mn and 0.2 % to 0.5 % C. These steels can be developed with a single, relatively inexpensive alloying element and by a single normalizing or normalizing and tempering heat treatment. C-Mn steels are also referred to as medium Mn steels. Mn- Mo cast steels are very similar to the medium Mn steels with the added characteristics of high yield strength at elevated temperatures, higher ratio of yield strength to tensile strength at room temperature, greater freedom from temper embrittlement, and greater hardenability. Hence these steels have replaced medium Mn steels for certain applications. There are two general grades of Mn – Mo cast steels. These grades are (i) with 1 % to 1.35 % Mn and 0.1 % to 0.3 % Mo, and (ii) with 1.35 % to 1.75 % Mn and 0.25 % to 0.55 % Mo. For both of these grades, the C content is normally selected between 0.2 % to 0.35 %, depending on the heat treatment process used and the strength characteristics needed. Mn – Ni – Cr – Mo cast steels are low alloy steels which are primarily produced for their high hardenability. Sections above 125 mm in thickness can be quenched and tempered to obtain a fully tempered martensitic structure. Ni cast steels are the oldest alloy cast steels and are characterized by high tensile strength and elastic limit, good ductility, and excellent resistance to impact. These cast steels contain 2 % to 4 % Ni, depending on the grade needed. Ni- Cr- Mo- cast steels – The addition of Mo to Ni – Cr steel significantly improves hardenability and makes the steel relatively immune to temper embrittlement. Ni- Cr- Mo cast steel is particularly well suited to the production of large castings because of its deep-hardening properties. In addition, the ability of these steels to retain strength at elevated temperatures extends their usefulness in many industrial applications. Cr – Mo cast steels – Cr contents of around 1 % or more provide a nominal improvement in elevated-temperature properties. The Cr steels (0.7 % to 1.1 % Cr) are not in common use. However, the Cr-Mo low alloy cast steels are widely used. Cu bearing cast steels – There are several types of Cu containing steels. Selection among these various types is primarily based on either their atmospheric corrosion resistance (weathering steels) or the age-hardening characteristics that Cu adds to the steel. High strength cast steels cover the tensile strength range of 1200 to 2060 N/sq mm. Cast steels with these strength levels and with considerable toughness and weldability were originally developed for military applications. These cast steels can be produced from any of the above medium alloy compositions by heat treating with liquid quenching techniques and low tempering temperatures. Cast high alloy steels are extensively used for their corrosion resistance in aqueous media at or near room temperature and for service in hot gases and liquids at elevated temperatures (more than 650 deg C). High alloy cast steels are most often specified on the basis of composition. Some of the high alloy cast steels show many of the properties of cast C and low alloy steels. Some of the mechanical properties of these grades (e.g. hardness and tensile strength) can be altered by suitable heat treatment. The cast high alloy grades that contain more than 20 % to 30 % Cr + Ni, however, do not show the phase changes observed in plain C and low alloy steels during heating or cooling between room temperature and the melting point. These materials are therefore non hardenable, and their properties depend on composition rather than heat treatment. Hence special consideration is to be given to each grade of high alloy cast steel with regard to casting design, foundry practice, and subsequent thermal processing (if any). Corrosion resistant high alloy cast steels are more commonly referred to as cast stainless steels. Cast stainless steels are defined as ferrous alloys that contain a minimum of 12 % Cr for corrosion resistance. Most cast stainless steels have of course considerably more complex compositionally than this simple definition implies. Stainless steels typically contain one or more alloying elements in addition to Cr (e.g. Ni, Mo. Cu, niobium, and nitrogen) to produce a specific microstructure, corrosion resistance, or mechanical properties for particular service requirements. The principal applications for these steels are as materials of construction for chemical processing and power generating equipment involving corrosion service in aqueous or liquid vapour environments at temperatures normally below 320 deg C. These alloys are also used for special services at temperatures up to 650 deg C.
Corrosion resistant high alloy cast steels are usually classified on the basis of composition or microstructure. Alloys are grouped as Cr steels, Cr-Ni steels (in which Cr is the predominant alloying element), and Ni-Cr steels (in which Ni is the predominant alloying element). The serviceability of cast corrosion resistant steels depends greatly on the absence of C, and especially precipitated carbides, in the alloy microstructure. Therefore, cast corrosion resistant alloys are generally low in carbon (usually less than 0.08 % C). Structures may be austenitic, ferritic, martensitic, or duplex with the structure of a particular grade is primarily determined by composition. Cr, Ni, and C contents are particularly important in this regard. In general, straight Cr grades of high alloy cast steels are either martensitic or ferritic, the Cr- Ni grades are either duplex or austenitic, and the Ni-Cr steels are fully austenitic. Martensitic grades include alloys which contain the minimum amount of Cr necessary to make it essentially rustproof. It has good resistance to atmospheric corrosion and also to many organic media in relatively mild service. A higher C modification can be heat treated to higher strength and hardness levels. Higher C alloy with Mo provides improved elevated temperature strength. In this series there is also an Fe-Cr-Ni-Mo alloy with low C content. Austenitic grade alloys have high Cr, high C, wholly austenitic compositions in which the Cr exceeds the Ni content. The more highly alloyed grade has excellent corrosion resistance in many environments and is often used in sulphuric acid service. Ferritic grades are practically non hardenable by heat treatment. In these alloys, the balance among the elements in the composition results in a wholly ferritic structure similar to wrought stainless steels. Austenitic ferritic alloys have the microstructures which usually contain 5 % to 40 % ferrite, depending on the particular grade and the balance among the ferrite promoting and austenite promoting elements in the chemical composition. Duplex alloys have high levels of ferrite (around 40 % to 50 %) and low Ni. They have better resistance to stress corrosion cracking (SCC). Alloy which contains no nitrogen (N) has a relatively low Mo content has only lesser resistance to localized corrosion than the alloy which has N and slightly higher Mo. Improvements in stainless steel production practices (for example, electron beam refining, vacuum and argon-oxygen decarburization, and vacuum induction melting) have created a second generation of duplex stainless steels. These steels offer excellent resistance to pitting and crevice corrosion, significantly better resistance to chloride SCC than the austenitic stainless steels, good toughness, and yield strengths two to three times higher than those of type 304 or 316 stainless steels. First generation duplex stainless steels have been in use for many years. The need for improvement in the weldability and corrosion resistance of these alloys resulted in the second generation alloys, which are characterized by the addition of N as an alloying element. Second generation duplex stainless steels are usually about a 50-50 blend of ferrite and austenite. The new duplex alloys combine the near immunity to chloride SCC of the ferritic grades with the toughness and ease of fabrication of the alloy with austenitic microstructures. Precipitation hardening grade alloys group are low C martensitic alloys which may contain minor amounts of retained austenite or ferrite. The Cu precipitates in the martensite when the alloy is heat treated to the hardened (aged) condition. Heat resistant high alloy steel castings are extensively used for applications involving service temperatures in excess of 650 deg C. Strength at these elevated temperatures is only one of the criteria by which these materials are selected, because applications often involve aggressive environments to which the steel must be resistant. The atmospheres most commonly encountered are air, flue gases, or process gases. These atmospheres may be either oxidizing or reducing and may be sulphidizing or carburizing if S or C are present. C and low alloy steels seldom have adequate strength and corrosion resistance at elevated temperatures in the environments for which heat resistant cast steels are normally selected. Only heat resistant steels show the required mechanical properties and corrosion resistance over long periods of time without excessive or unpredictable degradation. In addition to long term strength and corrosion resistance, some cast heat resistant steels show special resistance to the effects of cyclic temperatures and changes in the nature of the operating environment. A number of cast high alloy grades have been developed and successfully used for a variety of service requirements. There are three main categories, based on composition namely (i) Fe-Cr alloys, (ii) Fe-Cr-Ni alloys, and (iii) Fe-Ni-Cr alloys. These alloy types resemble high alloy corrosion resistant steels except for their higher C contents, which impart greater strength at elevated temperature. The higher C content and, to a lesser extent, alloy composition ranges distinguish cast heat resistant steel grades from their wrought counterparts. Fe-Cr alloys contain 8 % to 30 % Cr with little or no Ni. They are ferritic in structure and exhibit low ductility at ambient temperatures. Fe-Cr alloys are primarily used where resistance to gaseous corrosion is the predominant consideration because they possess relatively low strength at elevated temperatures. Fe-Cr-Ni alloys contain more than 18 % Cr and more than 8 % Ni, with the Cr content always exceeding that of Ni. They exhibit an austenitic matrix, although several grades also contain some ferrite. These alloys show greater strength and ductility at elevated temperatures than those in the Fe-Cr group and withstand moderate thermal cycling. Fe-Ni-Cr alloys contain more than 10 % Cr and more than 23 % Ni, with the Ni content always exceeding that of Cr. These alloys are wholly austenitic and exhibit high strength at elevated temperatures. They can withstand considerable temperature cycling and severe thermal gradients and are well suited to many reducing, as well as oxidizing environments. C steel castings are produced to a great variety of properties because composition and heat treatment can be selected to achieve specific combinations of properties, including hardness, strength, ductility, fatigue resistance, and toughness. Although selections can be made from a wide range of properties, it is important to recognize the interrelationships among these properties. For example, higher hardness, lower toughness, and lower ductility values are associated with higher strength values. Ductility depends greatly on the strength or hardness of the cast steel. Actual ductility requirements vary with the strength level. Quenched and tempered steels show higher ductility values for a given yield strength level than normalized, normalized and tempered, or annealed cast steels. Cast steels suffer less degradation of fatigue properties due to notches than equivalent wrought steels. When the ideal laboratory test conditions are replaced with more realistic service conditions, the cast steels show much less notch sensitivity to variations in the values of the test parameters than wrought steels. Under laboratory test conditions (uniform specimen section size, polished and honed surfaces, and so on), the endurance limit of wrought steel is higher than that of cast steel. The same fatigue characteristics as those of cast steel, however, are obtained when a notch is introduced or when standard lathe turned surfaces are employed in the rotating-beam bending fatigue test. Mass effects are common to steels, whether rolled, forged, or cast, because the cooling rate during heat treating varies with section size and because the microstructure constituents, grain size, and nonmetallic inclusions increase in size from surface to centre. Mass effects are metallurgical in nature and are distinct from the effect of discontinuities. The section size or mass effect is of particular importance in steel castings because mechanical properties are typically assessed from test bars machined from standardized coupons having fixed dimensions and are cast separately from or attached to the castings. The removal of test bars from the casting is impractical because removal of material for testing would destroy the usefulness of the component or necessitates costly weld repairs for replacing the material removed for testing purposes. Test specimens removed from a casting normally do not exhibit the same properties as test specimens machined from the standard test coupon designs for which minimum properties are established in specifications. The mass effect discussed above, that is, the difference in cooling rate between the test coupons and the part being produced, is the fundamental reason for this situation. Several specifications provide for the mass effect by permitting the testing of coupons that are larger than normal and that have cooling rates more representatives of those experienced by the part being produced. Coupon properties refer to the properties of specimens cut and machined from either a separately cast coupon or a coupon that is attached to and cast integrally with the casting. Typically, the legs of the keel block serve as the coupons. The legs of this keel block are 32 mm thick. Casting properties refer to the properties of specimens cut and machined from the production casting itself. A casting from which properties are determined in this manner is either destroyed in the process or requires repair welding to replace the metal removed for testing. The double leg keel block is normally the most prominent design for test coupons among those in use. The reliability of tensile test results obtained from the double leg keel block generally indicate that there is 95 % assurance that the strength is within 6.9 N/sq mm of the actual ultimate tensile strength and within 11 N/sq mm of the actual yield strength. The elongation results are within plus/minus 3 % and the reduction in area value are within plus/minus 5 %. When 32 mm thick test coupons are suitably attached to the steel casting and cast integrally with the production casting, the tensile properties determined for the coupon are comparable to those from a separately cast keel block. The properties determined from keel block legs whose dimensions exceed those of the double leg keel block (that is, thicker than 32 mm) may differ, especially if the steel involved is of insufficient hardenability for the heat treatment employed to produce a microstructure similar to that in 32 mm section keel block legs. Large mass effects are evident in several of the quenched and tempered steels and for the normalized and tempered materials. This also apply to low alloy steels of similar C content. Weldability of C steels is primarily a function of composition and heat treatment. C steels having low Mn and Si contents and C contents below 0.30 % can be welded without any special precautions. When the C content exceeds 0.30 %, preheating of the casting prior to welding is advisable. The low temperature preheat (120 deg C to 200 deg C) reduces the rate at which heat is extracted from the HAZ adjacent to the weld. Preheating also helps to relieve mechanical stresses and to prevent under bead cracking, because hydrogen (H) is still relatively mobile and can diffuse away from the last areas to undergo a metallurgical transformation. Preheating minimizes the chances of a hardening transformation occurring in the HAZ and therefore reduces the hardness adjacent to the weld. Stress raisers that could result from the hardened area can be eliminated in this manner. Generally, if the hardness of the HAZ after welding does not exceed 35 HRC or 327 HB, preheating of the casting for welding is not required. With the additions of the alloying elements to the steel, the need for preheating increases. Most of the low alloy steels require some preheating. When properly preheated, such steels are readily welded. A comparison can be made between the weldability of two steels by comparing their carbon equivalents (CE). Of the various formulas available, one that appears to be quite useful for cast steels is as follows. Steels having the same CE have approximately the same weldability and require similar preheating and other precautions. The alloy steels of higher hardenability require more care and must be preheated in the range of 200 deg C to 315 deg C. In fact, a few of the standards specify preheat temperatures that must be employed. The preheat temperatures specified are conservative and are based on the preheating temperatures normally used in the fabrication of piping assemblies, in which the stresses resulting from the shrinkage of the weld and restraint of the assembly must also be considered. In the case of some low alloy steels, especially those subject to toughness requirements, the inter pass temperature (maximum or minimum temperature of the weld bead before additional beads are laid) must be maintained at a prescribed low level to prevent embrittlement of the parent metal. In nutshell, the typical steel casting process begins with the order for the steel castings. The order creates a demand for raw materials (i.e. sand, binder, scrap steel etc.) and manufactured items such as cores. The pattern and core boxes are taken to the pattern shop and prepared for the casting production. Typically, the necessary cores are first made ready for setting as the moulds are being made. Next, moulds halves (upper and lower) are made and sent to the assembly area. At the assembly area, moulds are flow coated and cores are set in place. The moulds are then closed up for pouring. As the assembled moulds are being staged on the pour off lines, a heat is melted in the melting furnace. Liquid steel from the melting furnace is brought to the moulds on the pouring lines in a refractory lined pouring ladle. Once poured, the moulds are allowed to cool before next being sent to the shakeout. At the shakeout, the castings are separated from the sand mould. The sand is sent to a reclamation system so that it can be reused in the moulding process. As castings are removed from the shakeout they are sent to the cleaning room where they are ‘finished’ to the required specifications. Processing in the cleaning room includes shot blasting, cut-off, welding, heat treating and inspection. Heat treatment is an important step in the production of steel castings because it develops the mechanical properties of the hardenable steel. Several types of heat treatment are used. The essential elements of any heat treatment are the heating cycle and the cooling cycle. The length of time that a steel casting is held at temperature and the cooling rate are important factors. The holding time is to be long enough to complete the desired microstructural transformation. Annealing is practiced on low C steels to provide a soft, readily machinable structure. Annealed castings have relatively low strength but good ductility. In a full anneal, the castings are heated above the upper critical temperature, held there long enough to complete the transformation to austenite, and then furnace cooled at a controlled rate to obtain a stress relieved casting with a pearlite-ferrite structure that is ductile and readily machinable. There are variations of the annealing heat treatment for specialized purposes, for example, to achieve a spheroidized pearlite structure. The annealing temperatures of such specialized treatments may differ substantially from those of a full anneal. Full annealing and spheroidizing heat treatments are costly and are usually not specified unless maximum ductility is actually needed. Cooling is accomplished by reducing or by simply turning off the heat input to the furnace. When the castings have cooled to below the lower critical temperature (around 430 deg C), the transformation of austenite is usually complete. The castings are then removed from the furnace and air cooled or even quenched. Furnace cooling to lower temperatures merely wastes furnace time and requires additional heat to bring the furnace up to temperature for the next load. Normalizing consists of heating the steel to a suitable temperature above the upper critical transformation temperature, holding long enough to complete the transformation to austenite, removing the work from the furnace, and cooling it in still air. Some castings are tempered after normalizing. The castings must be placed in an area where the air can circulate freely around the casting. If air flow is restricted then the operation is more like annealing. On the other hand, accelerated cooling by fans or forced air flow can produce a result more like quenching. The microstructure that results from normalizing is a mixture of ferrite and pearlite, associated with only low residual stresses and almost no distortion. Tensile strengths up to 655 N/sq mm can be obtained in this way. The normalizing and tempering operation is used to meet a number of standard specifications in this strength range. Because of the uniform structure obtained upon normalizing, machinability is good. The cost of normalizing makes this heat treatment attractive. It requires less furnace time than annealing, and its cooling cycle is less expensive than quenching. In hardening by quenching, the steel casting is heated above the transition temperature and is fully austenitized. The casting is cooled more rapidly than in the other heat treatments. It is to be fast enough so that pearlite and ferrite do not have time to form. Water and oil are the media most commonly used for quenching steel castings. Water is used whenever possible. High C steels require oil quenching. Some complicated shapes also demand oil quenching to minimize quench cracking. Oil quenches a little more slowly than water at all temperatures. At lower temperatures, the cooling curves for oil taper off which means even slower rates than for water. Therefore, martensite forms more slowly in oil than in water. Certain organic chemicals can be added to water to produce a quenching solution that resembles oil in its heat removal characteristics. The main advantage of these solutions is that they have the behaviour of oil without the fire hazard. Their greatest disadvantage is that they coat the casting and so change the composition of the bath. The quench severity of these baths varies widely with small changes in composition. Tight control is necessary and sometimes difficult. The quenching of C steels is always followed by tempering in order to adjust the mechanical properties of the quenched steel. The higher tensile strength levels of C steels can be obtained only by quenching and tempering. The quenching and tempering operation produces the optimum combination of strength and toughness. Tempering is a heat treatment that follows quenching and sometimes normalizing. One purpose of tempering is to reduce the residual stresses that develop during cooling and transformation. Another objective of tempering is to modify the metallurgical structure of martensite and thus adjust strength and other mechanical properties to specified levels. Tempering consists of heating the steel casting to a temperature below the transformation range, holding for a specified time and finally cooling. C steels are tempered in the range of 175 deg C to 700 deg C. The holding time at temperature may vary from 30 min to several hours. A longer time at a given tempering temperature or a higher tempering temperature for a given time produces greater tempering. Martensite softens more than pearlite at a given tempering temperature. Composition also affects the tempering response. Carbide forming elements cause the cast steel to exhibit greater resistance to tempering. Tempering below 600 deg C can cause temper embrittlement in certain steels. Tempering is usually not done in this temper embrittlement range, and when higher tempering temperatures are used, the steel casting can be quenched from the tempering temperature to minimize time in the embrittling zone during cooling. Stress relief is done by heating to temperatures above 260 deg C. A stress relief treatment is sometimes required when operations are performed after heat treatment that leave residual stresses in the casting. Welding, induction hardening, and grinding are examples of such operations. The maximum temperature for stress relief is generally limited to 30 deg C below the tempering temperature that had been used in heat treating the casting to prevent it from softening. Since tempering is a stress relief treatment, there is no need for a special stress relief after tempering. Hydrogen causes low elongation and reduction in area in steel castings. If the steel contains 4 to 5 ppm of H, the ductility is around 20 % of that of H free steel. Hydrogen in steel is a mobile element. Above room temperature, the H diffuses from the steel, and ductility is restored. H removal can be accelerated by heating to 200 deg C to 315 deg C. This heat treatment is commonly referred to as aging. The aging time is proportional to section thickness. Generally, 25 mm equals 20 hours. For heavy sections (more than 250 mm, H removal by aging becomes impractical because of time requirements. Hardenability is the property of steel that governs the depth to which hardening occurs in a section during quenching. It is not to be confused with hardness, which is the resistance to penetration as measured by Rockwell, Brinell, or other hardness tests. Hardenability is of considerable importance because it relates directly to the strength of steel castings and to many other mechanical properties, notably, toughness and fatigue properties. The principal method of hardening C and low alloy steels consists of quenching the steel from the austenitizing temperature. Steels vary in their response to this quenching operation because the depth below the surface of a part to which the part hardens depends on the composition of the steel and the severity of the quench. Because cooling during a quench is fastest at the surface of a part and slowest at its centre and because the hardening reaction is time dependent, hardenability is a vital consideration in alloy selection. Carbon and low alloy steel castings are produced to a great variety of properties because composition and heat treatment can be selected to achieve specific combinations of properties, including hardness, strength, ductility, fatigue, and toughness. Although selections can be made from a wide range of properties, it is important to recognize the inter relationships among these properties. For example, higher hardness, lower toughness, and lower ductility values are associated with higher strength values. Strength and hardness – Depending on alloy selection and heat treatment, ultimate tensile strength levels ranging from 415 to 1720 N/sq mm can be achieved with cast low alloy steels. The normally expected Brinell hardness-ultimate tensile strength combinations of cast low alloy steels show that these two properties are directly proportional. Strength and ductility – Ductility is inversely proportional to the strength, or hardness, of the cast steel. Actual ductility requirements vary with the strength level and the specification of the required cast steel. Quenched and tempered steels exhibit higher ductility values for a given yield strength level than normalized and tempered steels. Strength and toughness – Several test methods are available for evaluating the toughness of steel, or the resistance to sudden or brittle fracture. These include the Charpy V-notch impact test, the drop-weight tear test, the dynamic tear test, and specialized procedures to determine plane-strain fracture toughness. Room temperature Charpy V-notch impact energy trends show that there is a distinct effect of strength and heat treatment on toughness. Higher toughness is obtained when cast steel is quenched and tempered, rather than normalized and tempered. Quenching, followed by tempering, produces superior toughness. Nil ductility transition temperatures (NDTT) from 40 deg C to as low as -90 deg C have been recorded in tests on normalized and tempered cast C and low alloy steels in the yield strength range of 200 to 655 N/sq mm. NDTT values of as high as 10 deg C to as low as -105 deg C can be obtained in the yield strength range of 350 to 1340 N/sq mm, depending on alloy selection. An approximate relationship exists between Charpy V-notch impact energy-temperature behaviour and the NDTT. The NDTT frequently coincides with the energy transition temperature determined in Charpy V-notch tests. Fracture mechanics tests – Plane-strain fracture toughness data for the various cast steels show that there exists the important strength-toughness relationship. Fracture mechanics tests have the advantage over conventional toughness tests of being able to yield material property values that can be used in design equations. Strength and fatigue – The most basic method of presenting engineering fatigue data is by means of the S-N curve. The S-N curve shows the life of the fatigue specimen in terms of the number of cycles to failure N and the maximum applied stress S. Additional tests have been used, and the principal findings for cast steels are highlighted in the following paragraphs. Constant amplitude tests – The endurance ratio (fatigue endurance limit divided by the tensile strength) of cast C and low alloy steels, determined in rotating-beam bending fatigue tests (mean stress = 0), is generally taken to be about 0.40 to 0.50 for smooth bars. The test data show that the endurance ratio is largely independent of strength, alloying elements, and heat treatment. Fatigue notch sensitivity q, determined in rotating-beam bending fatigue tests, is related to the microstructure of the steel (composition and heat treatment) and to strength. It is generally seen that q generally increases with strength (from 0.23 for annealed C steel at a tensile strength of 580 N/sq mm to 0.68 for the higher strength normalized and tempered low alloy steels). The quenched and tempered steels with a martensitic structure are less notch sensitive than the normalized and tempered steels with a ferrite-pearlite microstructure. Cast steels suffer less degradation of fatigue properties due to notches than equivalent wrought steels. When laboratory test conditions are replaced with more realistic service conditions, the cast steels show much less notch sensitivity than wrought steels. Low alloy steels are normally not considered to be corrosion resistant, and casting compositions are not normally selected on the basis of corrosion resistance. In some environments, however, significant differences are observed in corrosion behaviour such that the corrosion rate of one steel may be half that of another grade. In general, steels alloyed with small amounts of Cu tend to have somewhat lower corrosion rates than Cu free alloys. As little as 0.05 % Cu can have to exert a significant effect. In some environments, nominal levels of Ni, Cr, P, and Si may also bring about modest improvements, but when these four elements are present, the presence of Cu holds little if any additional advantage. Cast steels operating at temperatures above ambient are subject to failure by a number of mechanisms other than mechanical stress or impact. These include oxidation, H damage, sulphide scaling, and carbide instability, which manifests itself as graphitization. The environmental factors involved in elevated temperature service (370 deg C to 650 deg C) require that cast steels used in this temperature range be carefully characterized. The two alloying elements common to nearly all the steel compositions used at elevated temperatures are Mo and Cr. Mo contributes strongly to creep-resistance. Depending on microstructure, it has been shown that 0.5 % Mo reduces the creep rate of steels by a factor of at least 103 at 600 deg C. Cr also reduces the creep rate modestly at levels of around 2.25 %. At higher Cr levels, creep resistance is somewhat reduced. V improves creep strength and is indicated in some specifications. Other elements that improve creep resistance include W, Ti, and Nb. The effect of W is similar to that of Mo, but on a higher % of W is needed in order to be equally beneficial. Ti and Nb have been shown to improve the creep properties of C free alloys, but because they remove C from solid solution, their effect tends to be variable. Temper embrittlement is normally characterized by an increase in the Charpy V-notch impact transition temperature. It is generally associated with quenched and tempered cast steels, but it may also occur in normalized and tempered cast steels and may develop during either tempering or elevated temperature service. The tempering or service temperature range in which embrittlement occurs is considered to be 425 deg C to 600 deg C. During heat treatment, embrittlement can be avoided by rapid cooling through this range. The elements generally considered to cause embrittlement are P, Sn, Sb, and As. Mn and Si enhance the effect of P. An addition of 0.05 % Mo to alloy steels is very effective in reducing temper embrittlement. Alloy steels normally used for elevated temperature service contain at least this quantity of Mo and hence temper embrittlement during heat treatment is seldom a problem. However, in those cases in which castings must be cooled from the tempering temperature at a rate below 20 deg C per hour, it may be necessary to control the amount of temper embrittling elements present in the steel. When embrittlement occurs during service, no reduction in impact properties at elevated temperature is apparent. Instead, diminished impact toughness may be observed during periods of shutdown when the equipment is at ambient temperatures. There are applications that require the unique properties of cast steel. The generic term ‘steel’ covers a wide range of grades of materials. However, for the purpose of application of steel castings two alloy groups are normally considered. They are (i) C and low alloy (C&LA), and (ii) high alloy. High alloy grades include stainless steels and Ni base alloys. Austenitic Mn steels and all other non stainless steels are usually included in the C&LA group. The total steel casting production excluding high Cr irons is dominated by the C&LA grades. Some of the larger users are given below. Railways are the major user of the total production of steel castings. These parts are used in severe applications such as couplers, draft gears, side frames, bolsters, and wheels. Construction machinery manufacturers use substantial production of the steel castings. The applications here are as varied as the equipment produced. Parts range from end caps on hydraulic cylinders for a small backhoe to transmission housings on large earth-moving machinery. Valves and fittings of cast steel account for about 5 % of production and are used in steel and chemical industries, and for the drilling, recovery, transportation, and refining of natural gas and crude oil both on land and offshore. These parts vary in size from a few kilograms to many tons. Applications can be very severe requiring performance in corrosive liquids at both subzero and elevated temperatures. Operating pressures can reach many thousands of kg/sq mm. Heavy transport vehicles also use around 5 % of steel castings production. Some applications include axle housings, suspension brackets, wheels, brake parts, axle spindles, differential housings, and fifth wheels. Mining industry makes extensive use of steel castings for their extreme requirements of toughness and abrasion resistance both for ore recovery equipment and crushing mills. Both high Mn and other alloy steels are widely used, and these materials can only be produced as castings. Numerous other industries use steel castings. These range from food processing and electronics to oil and gas, defense and pulp and paper industries. In fact, castings touch every aspect of human lives.